Shop these products before the prices expire today. 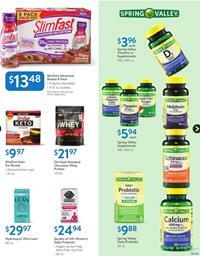 Find Avia, Russell activewear on pg 12-13 of the latest Walmart Ad. If you have an intense schedule of exercising you might be looking for extra nutrition like vitamins and supplements. Nutrition shakes that are rich in protein can support your muscle building with a boost in a short time. Spring Valley daily probiotics are digestive support and it will boost the process of digestion so that you will feel more comfortable during your exercising sessions. Find those protein shakes and vitamins on pg 11. After intense workouts, there are two important things to do. One is stretching moves that are called recovery and the other is protecting the muscle with easier workouts like indoor weight liftings with using dumbbells. I am not an expert but these are really common things known by people who exercise to stay fit all seasons. Find home gym kits, dumbbells, yoga mats, and similar products at lower prices on pg 14.